A thin band of antimatter particles called antiprotons enveloping the Earth has been spotted for the first time. The find, described in Astrophysical Journal Letters, confirms theoretical work that predicted the Earth’s magnetic field could trap antimatter. The team says a small number of antiprotons lie between the Van Allen belts of trapped “normal” matter. But it won’t be complete until they find Green Orion Women. Ya got me, pal. I stand by everything I wrote in my earlier review about mediocre, botched stories and cliche characters. My cynical side suspects that people are watching because they’re waiting for this “ambiguously lesbian” duo to admit their attraction toward each other and at last get it on. Sort of “Moonlighting” for gay couples. And that’s not just me being cynical (or salacious). After all that “are they or aren’t they” talk last season, the show has gone out of its way to practically scream “THEY’RE STRAIGHT! !” in the first three episodes. In the season premier, both women wind up in bed with men. In episode three, Sasha Alexander’s character “Maura Isles” practically drools on her own shoes over a guy, and she makes it crystal clear that it’s all about lust and wanting a man. Seriously, it’s my opinion the showrunners were exploiting the subtle “lipstick lesbian” angle to draw viewers and now they’re trying to dial it back. Maybe the stars have complained, since both have denied there’s anything there. Whatever. I’ll give them credit for a sense of humor, though: at one point in episode three, Rizzoli gets a worried look on her face and asks Isles “You don’t want to sleep with me… do you?” To which Isles says no, of course not. And then, at the end of the episode, to get rid of the now-annoying guy Isles had wanted to bed, they have to pretend to be… lesbian lovers. Still can’t see why the show is a hit, though. I really scored this weekend. No, not like that! 😦 Get your minds out of the gutter! 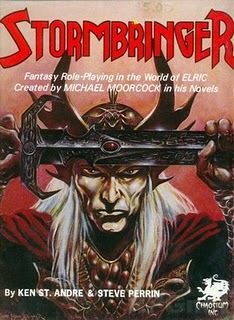 The game is based on the novels of Michael Moorcock, which are set in his “Million Spheres” multi-verse and which chronicle the adventures of Elric, last Emperor of Melniboné (which he destroys), as he travels around the world — which he destroys. (Really, if you ever meet Elric on the road, run.) The game’s title is the name of his soul-sucking demonic sword, which eventually destroys Elric. I’ve always been a fan of Chaosium‘s (2) games (you can see the cover of my favorite, Call of Cthulhu, in the sidebar), and Stormbringer is no exception. The magic system is, for me, what makes it special, being based on the summoning and binding of demons, which, being creatures of Chaos, have an infinite and entertaining variety. Later editions included a “design-a-demon” system, so would-be planet-conquering sorcerers could “roll their own” and save the GM some work. Sadly, while I own several editions of the game, I’ve never gotten to play; it’s a niche within the roleplaying game hobby, and I suspect those interested are few and far between. But, back to the big purchase, I was happily surprised at what good shape it was in (as if new off the shelf) and that it was complete — even the original dice, it seems. It also included the first supplement, the Stormbringer Companion. I assume this was a bonus; I don’t think the boxed set ever included it. Regardless, this is one of the better purchases I’ve made in a while, and I’m looking forward to reading it. (2) Sad to say, the company is a shadow of its former self. There should be a law that says food on a plate shouldn’t move. Especially when you’re about to eat it. But this food in the video below? It moves. Oh boy, does it move. And thereby hangs a tale. Let me say this one more time, the squid (head removed, tentacles left on) was killed, like a lobster, just before the meal was served. If you eat animals, this squid died the way cows, fish and birds die; to feed us. Nothing especially cruel in that. But being dead, how come it “danced” off the plate? Follow the link above for more. More at Gawker. And people wonder why I don’t like seafood — that’s because it turns undead and comes back to destroy us, you fools!